RunSwitch partner Scott Jennings joined Brit Hume “On The Record” on Fox News to discuss three polls which show a tie, a small lead and a large lead in the presidential election. 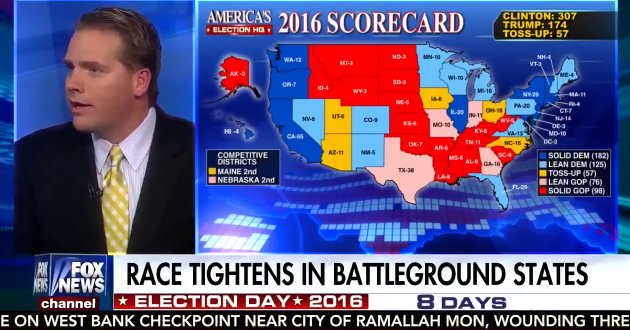 RunSwitch partner Scott Jennings joined Fox News host Tucker Carlson “On The Record” to discuss the first round of polling after the third and final presidential debate. RunSwitch partner Scott Jennings went “On The Record” with Fox News host Brit Hume to explain poll volatility in the 2016 presidential election. Scott Jennings joined MSNBC to discuss the latest polls and Donald Trump’s strategy heading into election day. RunSwitch partner Scott Jennings appeared on Fox News last night to go “On The Record” with Brit Hume. Jennings discussed the latest polling the presidential race. RunSwitch partner Scott Jennings joined Fox News host Brit Hume to discuss Donald Trump’s performance in the second presidential debate. RunSwitch partner Scott Jennings appeared on On The Record with Brit Hume to discuss the second Presidential debate between Hillary Clinton and Donald Trump.